On first acquaintance, Ara‘s debut full length is an overly-loaded and somewhat chaotic maze of constructs seemingly intended for chronic riddle-solvers. Increased familiarity, however, reveals Devourer Of Worlds to be an album of multiple layers but one that has been created as a single, forty-five minute-long suite of compositions. Individual pieces revolve around the kernel of a musical theme – one that is usually amelodic and jarring – that is developed over the course of said piece, through a field of jagged-edged asides that, at times, bear no significance on the evolution of the original idea. Ara make it paramount for the listener to not lose sight of the trail of bread crumbs that they leave scattered across this album, but even the most painstaking concentration can only betray the fact that Ara themselves get carried away on occasion with their strange world-building. Devourer Of Worlds straddles the line between adventurous, unconventional albums by bands like Gorguts, and outright post-metal territory where all pretense to traditional metal norms is renounced. In many ways, this approach resembles a consciousness post the act of re-indoctrination, one that has left behind all but the faintest vestiges linking it to its past life, yet finds a foggy recollection intruding into its present in unforeseen ways.There is a tacit recognition of the need inherent in all metal to write songs containing a hook that registers itself in the listener’s psyche, saving the album from being a cacophony of unrelated sounds. The foundation of these songs consists of progressions that, though filled to the brim with chords and chord changes, aren’t all that different from a lot of dissonant death metal. Where Ara part company with technically progressive but conventional death metal is in the way they build atop this foundation. Ara are compulsively prone to sending up multi-pronged, probing tendrils from this launching pad, a proclivity that sometimes border on the gratuitous. Compositional quirk or otherwise, their reason to exist becomes untenable when seen in the light of overall context; Ara, as heard on their The Blessed Sleep EP, are still at their best when they slow down and pull back from hyperactivity to let their ideas truly catch traction. While most modern technical death metal fails at creating any kind of atmosphere, Ara build an imposing monument to a dehumanized future but not at the price of a certain feeling. At crucial junctures on songs like ‘Obelisk’ and ‘Devourer Of Worlds’, Ara show admirable grasp of cathartic release in the vein of classic heavy metal. In overall pose and attitude,also, Devourer Of Worlds shares more in common with confrontational death metal than it does with newer mathcore. An extremely busy album and one not for everyday listens, this is a welcome addition to the field of challenging extreme metal music. 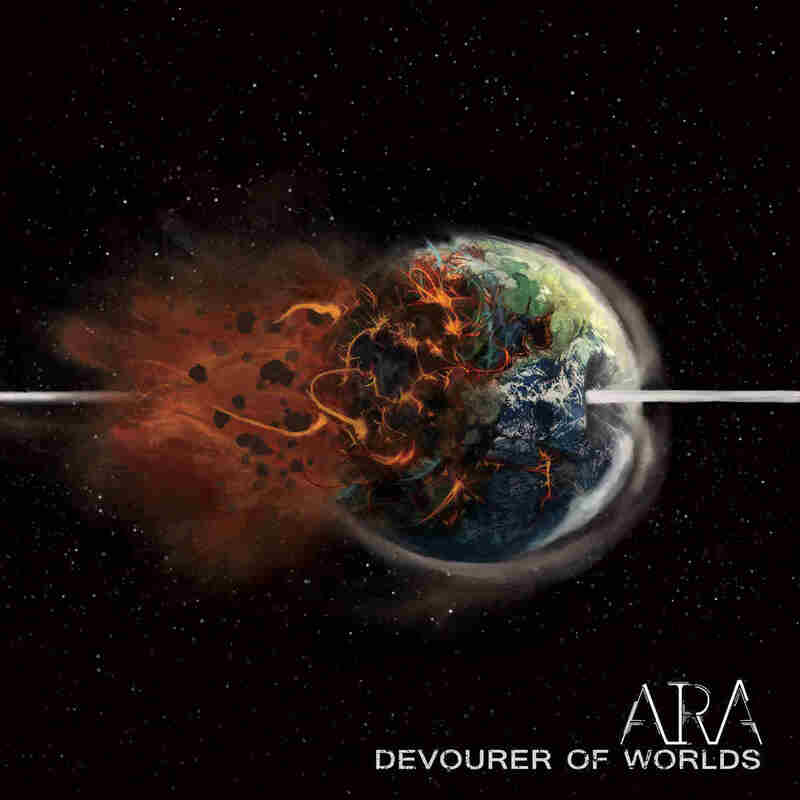 This entry was posted in Death Metal and tagged ara, Devourer Of Worlds. Bookmark the permalink.